David De Gea has been considered arguably the top goalkeeper in the Premier League for years and now can claim an elusive bit of hardware to back it up. Despite his long track record of success, De Gea had never taken home the Premier League Golden Glove award, which is handed out each season to the goalkeeper who keeps the most clean sheets on the campaign. The Manchester United goalkeeper earned his 18th clean sheet of the season in a scoreless draw against West Ham United on Thursday, ensuring that he finishes on top of the 2017-18 Premier League charts for the category. Manchester City’s Ederson, who currently sits in second place, holds 16 clean sheets having sat out his club’s 3-1 victory over Brighton on Wednesday and with one game remaining, cannot catch his counterpart on the red side of Manchester. The award, which was first handed out in 2004-05, has seen six different winners since its inception. Joe Hart, then of Manchester City, and Petr Cech, with both Chelsea and Arsenal, are the career leaders with four Golden Gloves each. Former Liverpool goalkeeper Pepe Reina has won the award three times. Thibaut Courtois, Wojciech Szczesny and Edwin Van Der Sar each took home the award once. De Gea becomes the first Manchester United goalkeeper to win it since Van Der Sar in 2008-09, and the first Spain goalkeeper since Reina in 07-08. With 18 clean sheets on the season, De Gea has already secured the highest total in the category since Joe Hart also landed on that number in 2012-13. 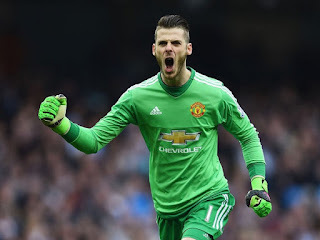 If he can add another in Manchester United’s final game of the Premier League season, at home against Watford on Sunday, De Gea’s total will be the best Van Der Sar managed 21 in his victorious season. The best for any goalkeeper since the award began was in its debut season, when Petr Cech picked up 24 clean sheets for Jose Mourinho’s title-winning Chelsea side. It is also the third time a Mourinho goalkeeper has won it, with Cech taking it pn both previous occasions, the second time in 2013-14. While it is De Gea’s first Golden Glove, he has certainly received individual Premier League honors before, having been named to the league’s team of the season on five separate occasions, including this campain.